On Facebook, people like stuff. On Twitter, people tweet stuff. On Pinterest, people pin stuff. Pinterest, the 3rd largest social media platform and known as a time sucking vortex of beautiful images- is actually proving to be quite a useful tool as well. In fact for many professions, Pinterest is the premier platform. For any of you still stuck in 2008, Pinterest is an online pin board that allows people to pin useful websites and other interesting tidbits from the Internet by grabbing an image from that site and posting it on your board. You can arrange the images on themed boards and followers can choose to follow ALL your boards or one particular board. So what does this have to do with education? You’ve been to school right? Bulletin boards are everywhere- outside and inside the classrooms showcasing student work, current school news, and other important information. The online pin board is just as helpful- maybe even more so than its literal counterpart. In fact, Pinterest is currently considered the inspiration hotspot for cooking, design, and…education. Not convinced yet? Let’s go through how to use Pinterest, how to find useful educational tools, and then how it can benefit your classroom. So why Pinterest and not Facebook or Twitter? Well first things first – Twitter is a great tool for educators and needs its own article on the matter! But Pinterest does have advantages over both other platforms that you may not have thought of. The Pinterest search tool is a powerful way to reach people you are not connected to yet. When you type a keyword in the search bar, you access hundreds, if not thousands of ideas from all over the world. Facebook does not have that capability. Facebook is about connecting with family and friends you know; Pinterest is about getting to know people who have similar interests. Pinterest is a visual tool that inspires creativity and ideas in a way that 140 characters cannot. Twitter works well for finding challenging articles and conversation, but sometimes you need a burst of inspiration. The layout of Pinterest makes it simple to quickly identify crafts, lessons, plans, and/or statistics that could be helpful in the classroom. Pinterest is an education hub. If you think only foodies and fashion gurus are on Pinterest, think again. Education is one of the fastest growing categories of boards and pins. After all, teachers know how to rock a bulletin board right? Pinterest is less personal than other platforms. Connecting on Facebook with students and parents can be a slippery slope. Blurring the line between your work and personal life is difficult to manage well. The Pinterest profile is incredibly streamlined. No mention of what you did over the weekend, who your friends are, or tagged photos of you. It’s simply a tool for collecting the best and most innovative content you can find on the web. Pinterest doesn’t have a limit on how many people can follow you. This is the same for Twitter, but on Facebook – you are limited to 5000 friends. They also frown upon friending people who you do not know outside of Facebook. They may just be the people you need to help you take your lessons to the next level! Go to Pinterest.com and click Create Account. Use your Facebook or Twitter login information, or simply use a valid email address to sign up. 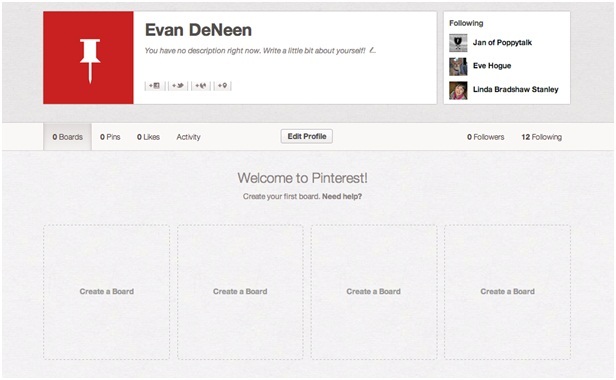 Once you’ve created a profile and username, it will ask you to follow five boards. This is simply a way to get you in the “Groove” of Pinterest. Simply find five topics or categories that are of interest to you and hit follow. (You can always unfollow later). Go to your email and verify your account. Now you are ready to pin! Before you get too far, you’ll want to fill out your profile. If you are using this account primarily for educational purposes, make sure to use your school email address, plus any websites or blogs you have attached to your classroom. In the top right hand side of the screen, click on the arrow next to your name. Click on settings. Fill out all the information in the screen and click save. Once you hit save, go back to the top of the screen and click directly on your name. Now you will see your profile AS OTHERS SEE IT. It’s time to set up your boards! Boards are a great way to organize and categorize the things you love from the Internet. As a teacher, you are probably continuing scouring the web for new ideas, gadgets, tips, and tricks to make your classroom more inviting and your lessons more exciting. Pinterest will keep all of these snippets in one place and at the same time, will be available to other teachers who might benefit from your research and ideas. You in turn, will benefit from theirs as well. Click on your name and go to your profile. Here is what you’re page looks like without any boards. 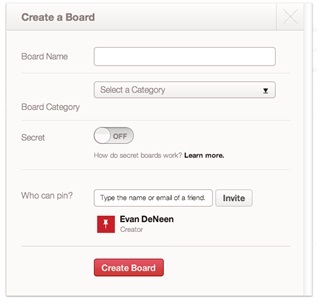 Hover over the “create a board” link and click on Create a Board. Here’s where you need to have thought through how you’d like to organize your materials. For example, you might have a board called, “lesson ideas, classroom gadgets, education philosophy, great edblogs, fun projects, teaching humor, etc.” Name your board and select the proper category it belongs in. This will help other people find it more easily. Continue creating boards until all your topics are covered. Now we need to find some things to pin. There are two main ways people find useful educational resources to pin. 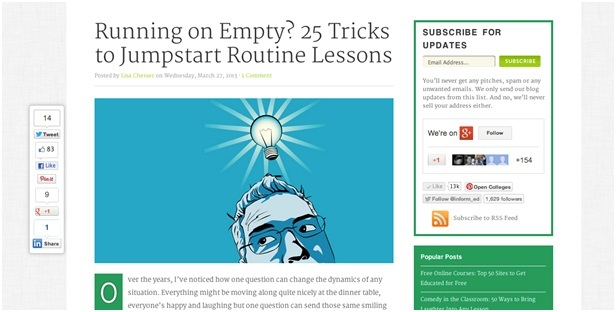 First, you may be on the Internet reading a great news article or blog (like this one!) and decide, “I want to keep this for future reference.” In most cases, the website will have a pin it button right on their site. All you have to do is hit the “pin it” button and another window will open. You choose the board you want to put it on, add a comment, and hit pin. Notice the Open Colleges pin it button is on the left near Facebook and Twitter. But what happens if the website you are viewing does not have a pin it button? You have two options. You can upload the website manually (which isn’t all that hard) or you can get a pin it bookmarklet for your Web Browser. Let’s walk through how to add the pin manually. Open a new window and go to your Pinterest account. In the top right hand corner, click on +add. Choose the option add a pin. Paste the URL address into the bar and click find images. It will pull up all the images on the screen. Scroll through (using the arrows) until you find the image that you like. Choose the board you want to add it to. Describe your pin using relevant words. Keywords are important because it is a way for other people to find your pins. Click pin it! It will now appear on your board. If you’d rather get the Pin It bookmarklet, go to About on the top of the screen and choose Pin It Button. Follow the instructions and it will put a bookmark on your browser. Whenever you are on a website that you want to pin, click the button and it will take you through the steps. 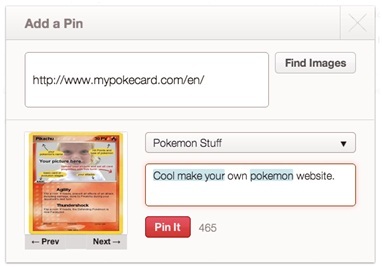 The second way that people pin resources….is by looking on Pinterest! Since education, food, and fashion are some of the hottest uses for Pinterest, there will be an ABUNDANCE of ideas to choose from. Let’s start looking. In the top left hand corner, type in a keyword that interests you. For example, you could try typing in math lesson ideas. Scroll through until you find an image and description that looks interesting to you. Once you choose one, click on the image. This box is super important. Do you see how many follow buttons there are? Each one can help you follow things that are interesting to you. But first, let’s check out this pin more closely to see if it is something you want to keep on your own board. Click on the image again. It will take you to the website where it was found. Read through the site and determine whether it will benefit you. If so, go back to the Pinterest window and we’ll repin it. If you hover your mouse over the image, a small repin button will show up on the left side of the image. Click on it and it will ask you what board you want to pin it onto and if you want to edit the comment. Now let’s go back to the earlier discussion about all those follow buttons. When you’ve found a pin that you like by searching for keywords, chances are the person who pinned it might have a board you are interested in. Let’s pull up this image again and explain what all those follow buttons do. The first follow button is on the top right hand part of the screen. Clicking it means that you will follow that person. The thing is, she may have boards you aren’t interested in, so only follow a person if they are a good match to your preferences. The next follow button is under the image on the right. That follow button allows you to follow the specific board she pinned it onto. In our example, the name of the board was Lesson Plans around Children’s Books. If that is something you want more of, follow the board. The follow button below that (and to the left) is where the pin originally came from. Someone named Jacqueline has a board called “apples” and pinned the lesson onto it. If you are planning an apple unit, you may want to follow the board, or at least go check it out. Click on the “A is for Apple” to see the whole board. With this method, you can easily spend HOURS finding boards and people will all sorts of interesting ideas. Whenever something strikes you, pin it onto your board! Start following boards of people that are in the same field as you. Pinterest is not like Facebook. There is no rule that says you must know the person you are following. So in review, to find something interesting – type in a keyword in the search bar. Scroll through the result until you find one you like. Click on it. If it is noteworthy, pin it. But don’t stop there. Follow the trail underneath the image to find more pins and boards similar to what you were searching for. If you are starting a Pinterest account, why not leave a sign up sheet in the teachers’ area? 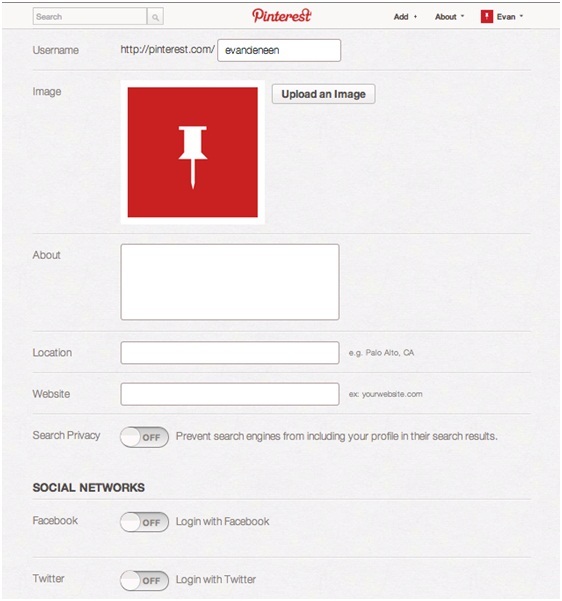 Everyone can write down their Pinterest profile name and follow one another. 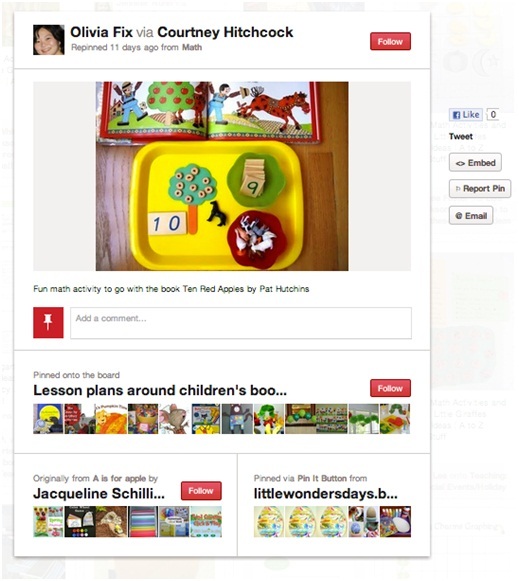 Many teacher blogs have Pinterest buttons right on their site so you can follow that way too. So far, we’ve filled out our profile, created our boards, and discovered how to find interesting tools and resources to pin. Now you have logged off of Pinterest and logged back in a few days later. When you log back in, it may feel a bit disorienting. 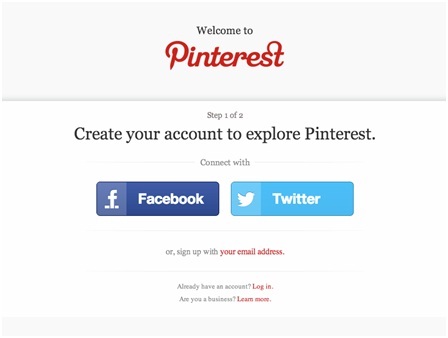 When you login to Pinterest, it takes you directly to your newsfeed. This is a recent showcase of the people you’ve followed and what they’ve pinned. You may find some interesting new items to pin or perhaps you want to go right to the search bar and look for something specific. Occasionally, someone you’ve followed has a lot of stuff you aren’t interested in. Click on their profile shot and then unfollow any of the boards that aren’t interesting to you. One important note: Pinterest is in the process of rolling out a new look. Some of you may have the old look and some may have the new. The instructions above were for the old. Everything is the same with the new, with the exception of the menu at the top. In the old look, there were several choices to the left of your name. On the new look, they all are underneath your name in a drop down menu. This is the fun part. Now that you’ve gotten the hang of using Pinterest, you can create boards that help enrich your classroom. Here are some ideas to get you started. No matter what age or grade you teach, every teacher has a reading list of some kind for their students. Design a reading board on Pinterest. You can pin all the books that your students must read for the year, and even pin up interesting articles and websites that students can choose from when writing up homework assignments. Or, if you’d rather, pin up all the books that you have read as a class. The board can be a running tab or collection for other teachers and your students’ parents to look through. When you create a board, you can invite other people to pin. If you are a high school teacher, invite your students to pin their interesting reads right onto the board too. All you need is the email address of your student. For parents, a classroom board is a great way to stay connected with the educational process. You can create a science board, social studies board, and even a homework board. Use them to highlight special pieces of work from top students. For example, if you’ve done a science fair project on photosynthesis, upload the project images to a photo-sharing site and pin them. Along with the projects, pin up the resource websites you used during the project. For homework help, pin resource websites that connect with the lessons you are teaching in the classroom. 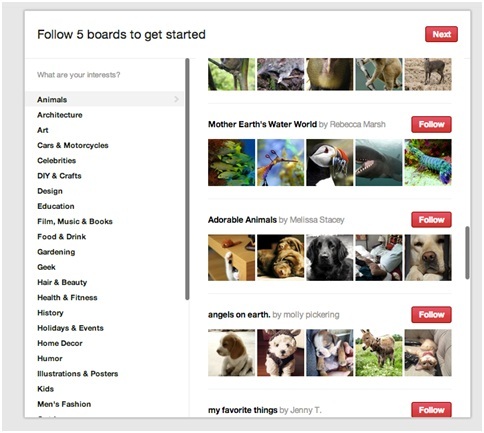 Everyday it seems that there are new WordPress plugins for Pinterest. If you have a teacher blog, use some of the widgets to bring your latest pins onto your sidebar. It’ll encourage other teachers and classroom parents to check out your boards. The Internet can be full of useful and useless information. If you are social studies teacher that likes to focus on current events, create a board where you pin the news stories that you’d like your students to read. This way, you can help filter out some of the less reliable news that they may stumble upon. When you find a pin you like, there is the option on the right hand side to tweet the pin to your followers. You can also embed it into a blog post, email it to a friend, and of course – like it on Facebook too! Pinterest boards can be fabulous planning tools. If you are designing your upcoming foreign language unit, create a board to pin all your ideas for the lesson plans. This way, when it’s time to write it up, you can go to your board and look through all the ideas and access the websites quickly. If you share your boards with other teachers, they can also contribute to the planning by pinning helpful websites they have found. Pinterest allows multiple people to pin to one board, which is great for teacher collaboration. Teaching the same subject over and over can become boring and dull when you have no motivation to spice up the curriculum. Start following other educators on Pinterest and find inspiration in their new ideas and fresh innovative projects. You’ll have more ideas than you know what to do with. Sometimes students (and teachers too!) need encouragement. Start a quotes board on Pinterest that centers on doing your best or valuing education. These quotes can provide a quick pick me up when morale is low. Following other people with quotes boards can give you a clever saying to write up on the chalkboard each morning. Do you want to get your classroom involved in community service in some way? Create a board that gives your students quick access to local non-profits, local news, and other websites that help explain how to start a grassroots project or offer humanitarian aid to an impoverished area. For art teachers, you will have more ideas than you can possibly implement. Pin up color wheel charts, painting tips, and the latest sculpting techniques. Create a blog to showcase your student’s work and pin up the end results. Connect with local artists and pin some of their work for inspiration. You can arrange your boards according to medium, so for example, you can have a board about painting, a board about art history, a board about collages, drawing, and sculpting. You can even create an ideas board and have your students pin up projects they’ve seen online that they’d like to recreate in the classroom. Gathering materials for a project can be overwhelming. You could bypass this process by giving your students a board full of resources to choose from. Or, if you want to teach your students about how to research, allow them to create the research project board and then use it for classroom discussion to evaluate what sites were acceptable and what ones were not. When you create a board, there is the option to make it secret. This is useful if any of your parents are concerned about Internet safety. No one will be able to find the pins in the categories area, search results, or on individual profiles. Home economics has never been so fun. As a life skills teacher, any and every project or craft or skill you can think of is on Pinterest- somewhere. Use it to get inspiration for your class lesson, or create your own boards according to skill (i.e. sewing, cooking, parenting, etc.). For as much inspiration on Pinterest, there is also a lot of fluff and spam to wade through. Don’t follow just anyone. If you like a particular teacher’s style, consider following one board first, before following all the boards. This isn’t the first time that I hear that popular social networking sites can be beneficial when it comes to the learning process. Despite the fact that you can find like-minded people online, you can share the experience you have and perhaps influence somebody’s way of studying. Pinterest is very popular with the teachers and it is good that they can share the activities and the worksheets they have come up with online. This is the place where you can ask for and get professional advice or feedback from the leaner. Love to see such kind of dynamic interaction with people, companies, friends etc. on the web. Technology advancement has really contributed immensely to modern education.